Debbie and I have been working quite a bit on the content for this blog. Part of the magic is improved food photography. This blog post will feature not only the wonderful flavors of the Kalbi Korean BBQ on the Big Green Egg but the new photography skills we have been learning. 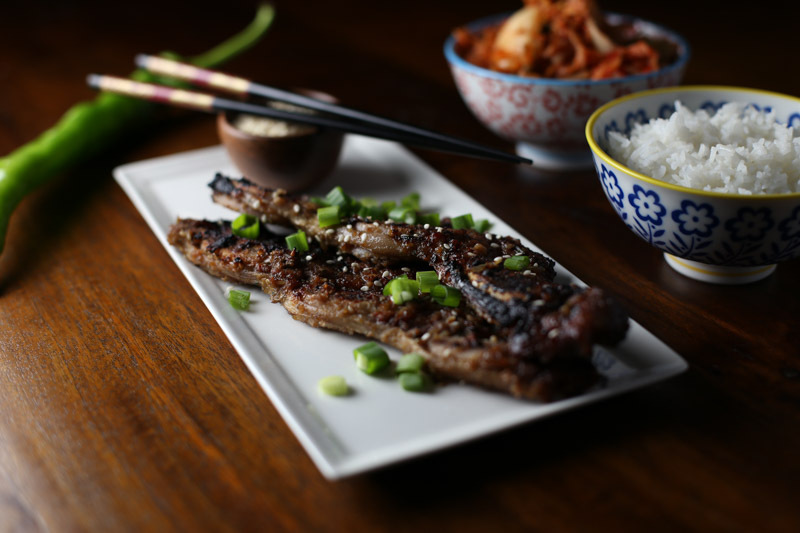 Sit back, relax, and enjoy this post (and recipe) for Kalbi Korean BBQ on the Big Green Egg. So we made the jump in to food photography head first this week with the purchase of our first high end DSLR. We have been taking classes online to learn the “ins and outs” of our 5 year old DSLR. We quickly knew that what we had would not get us to where we wanted to go. My friend Toan is an incredible photographer and was gracious enough to answer all of our questions. With his council and patience we found our way to the Canon EOS 6D. This coupled with the classes we have been taking online took our photography to the next level. Keep checking the blog and our InstaGram account for new and improved food photos! Note: This post has a mix of iPhone and DSLR photos. Some of you know I have two wonderful children (Jessica & Zachary). Their mother is Korean and as the kids were growing up I developed quite an affinity for Korean food. As a result of that experience I know Korean food quite well and really want to learn to cook the items I like the most. First up… Kalbi. In Korean the word “kalbi” (translates to “rib”). The dish’s full name is kalbi gui, with the word “gui” (translates to “grilling”) commonly omitted. To make this dish as authentic tasting as possible you need to go to a Korean Grocery Store. If you don’t this dish will just not taste the same. We went to Lotte in Chantilly to find all the ingredients to make this Korean BBQ dish! Shopping at the Korean grocery is quite the experience and we find that most of the groceries are less expensive than the American grocery stores we normally shop at. Once home we get all the ingredients out and begin the prep. First, grate the Korean Pear and mix with the Rice Wine. Next make cross cut slits on the beef short ribs (see below). Then rub the beef ribs with the rice wine and pear mixture. Let the ribs marinate for 30 minutes while you mix the other ingredients. Mix together the soy sauce, sugar, sesame oil, onion, and garlic. After the ribs have marinated overnight setup the Big Green Egg for direct grilling and preheat the Big Green Egg to 450°. Turn the ribs and cook for another 5 minutes. Take the ribs off the egg and let rest for 10 minutes. Sprinkle black pepper, sesame seeds, and green onions. Serve with rice (Bap) and Korean side dishes (Banchan). Enjoy! This recipe for Korean BBQ (Kalbi) is perfect for grilling on the Big Green Egg. Authentic flavors shone in the classic Korean dish.